"70cl / 54.3% - Forty years after Black Tot Day in 1970, the day when the British Royal Navy's 300 year old practice of daily rum rations stopped, the Black Tot Last Consignment gives us insight into the history of rum and Naval traditions. Royal Navy rum had been imported from the West Indies since 1784, although the Tot tradition began in 1655. Black Tot Last Consignment is made with the last remaining stocks of Royal Navy rum, which had been stored away in stone flagons since July 31st 1970 when the last call of ""Up spirits"" was heard. 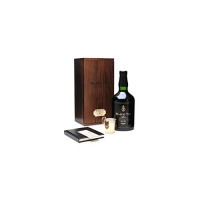 This piece of history has been beautifully bottled at 54.3% abv and comes with a Tot cup, similar to those used in the days of daily rum rations, a wooden display case, a rum ration card and a book about the history of Black Tot, written by rum expert Dave Broom."